Comment: Argues that lower rates of boys/male students at Malaysian public universities, a “reverse gender gap”, affects men from lower income groups. In STEM subjects except Engineering, the gender parity index is higher for women. The author suggests reasons are more men choose alternative careers, and can afford to enrol in private universities. The gender parity is more equal in private universities and the author argues this is a class issue and that addressing the gap will improve social equality overall. Abstract: This paper examines the growing gender gap between men and women in Malaysian public universities, using the Gender Parity Index (GPI) to measure gender disparities over time. It considers the gender gap in University of Malaya with other prominent overseas universities, and compares the GPI between all twenty public higher education institutions for the years 2009-2013. It also compares the GPI of public universities in Malaysia with local private education institutions, and examines the gender disparities in public universities in terms of subject segregation. Particular attention is paid to the gender segregation in terms of Science, Technology, Engineering and Mathematics (STEM) subjects; gender segregation in STEM subjects in Malaysian public universities is compared to East Asia Pacific averages. Lastly, various causes and explanations for the gender gap are explored. Comment: This is an interesting article to contrast results we see for gold OA. The article predicted, using business theory, that gold OA would reach 50% between 2017 and 2021, and 90% by 2025. This of course contradicts the saturation (if correct) that we see in gold OA (outside Latin America). Abstract: Open access (OA) is an alternative business model for the publication of scholarly journals. It makes articles freely available to readers on the Internet and covers the costs associated with publication through means other than subscriptions. This article argues that Gold OA, where all of the articles of a journal are available at the time of publication, is a disruptive innovation as defined by business theorist Clayton Christensen. Using methods described by Christensen, we can predict the growth of Gold OA. This analysis suggests that Gold OA could account for 50 percent of the scholarly journal articles sometime between 2017 and 2021, and 90 percent of articles as soon as 2020 and more conservatively by 2025. Notes: Report examining pay disparities across three broad groups in UK academia (black, asian, white) and with respect to gender. Finds significant disparities that are more significant than gender gaps and that gender gap in pay is greatest for white staff. Differences are seen across academic and professional staff but the differences are greater when academic staff alone are considered. Abstract: Caught at the crossroads? An intersectional approach to gender and ethnicity pay gaps takes an ‘intersectional’ approach to pay gaps by looking at ethnicity and gender together, rather than in isolation. The report shows that ‘pay penalties’ for ethnic minority groups are significant, with Black men and Black women earning the least on average relative to White men. The report includes recommendations for employers to consider when looking at gender and ethnicity pay gaps and when developing action plans. Notes: An interesting study using a search term strategy to examine the size of databases. Wondering whether something analagous can be used to estimate the size of sets based on partial data. Here they use a range of searches from single letters and numbers through to common words to estimate the scale of various databases. They find Google Scholar is significantly larger in terms of search results. Abstract: Information on the size of academic search engines and bibliographic databases (ASEBDs) is often outdated or entirely unavailable. Hence, it is difficult to assess the scope of specific databases, such as Google Scholar. While scientometric studies have estimated ASEBD sizes before, the methods employed were able to compare only a few databases. Consequently, there is no up-to-date comparative information on the sizes of popular ASEBDs. This study aims to fill this blind spot by providing a comparative picture of 12 of the most commonly used ASEBDs. In doing so, we build on and refine previous scientometric research by counting query hit data as an indicator of the number of accessible records. Iterative query optimization makes it possible to identify a maximum number of hits for most ASEBDs. The results were validated in terms of their capacity to assess database size by comparing them with official information on database sizes or previous scientometric studies. The queries used here are replicable, so size information can be updated quickly. The findings provide first-time size estimates of ProQuest and EbscoHost and indicate that Google Scholar’s size might have been underestimated so far by more than 50%. By our estimation Google Scholar, with 389 million records, is currently the most comprehensive academic search engine. Gusenbauer, Michael. 2018. “Google Scholar to Overshadow Them All? 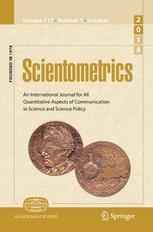 Comparing the Sizes of 12 Academic Search Engines and Bibliographic Databases.” Scientometrics, November. https://doi.org/10.1007/s11192-018-2958-5. Comment: This articles compares samples of data from Scopus with Dimensions. It found that the citation counts in Dimensions are in line with those obtained in Scopus. The slightly lower numbers in citations give indication that the coverage of Dimensions may not be much greater than that of Scopus. Although, this is not explicitly checked. Abstract: Dimensions is a partly free scholarly database launched by Digital Science in January 2018. Dimensions includes journal articles and citation counts, making it a potential new source of impact data. This article explores the value of Dimensions from an impact assessment perspective with an examination of Food Science research 2008–2018 and a random sample of 10,000 Scopus articles from 2012. The results include high correlations between citation counts from Scopus and Dimensions (0.96 by narrow field in 2012) as well as similar average counts. Almost all Scopus articles with DOIs were found in Dimensions (97% in 2012). Thus, the scholarly database component of Dimensions seems to be a plausible alternative to Scopus and the Web of Science for general citation analyses and for citation data in support of some types of research evaluations.